Scheduled Release: Now available! Scroll down for order form (for Lincoln calendar and book, as well as Red River Gorge calendar and book). 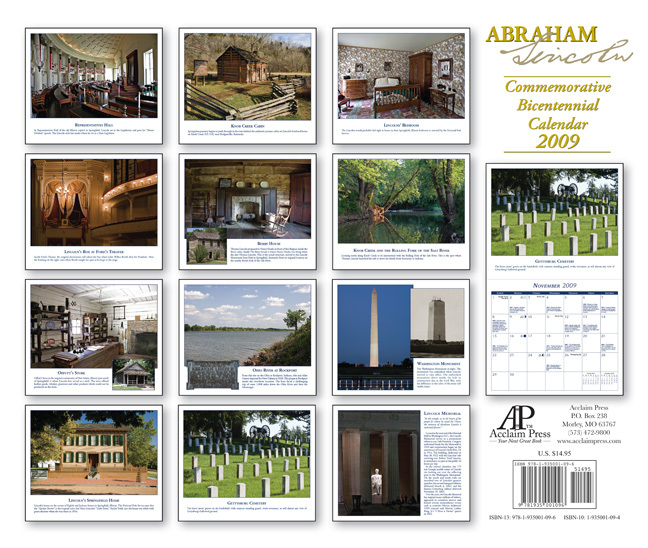 Following the release of our successful book, "Through the Eyes of Lincoln, A Modern Photographic Journey," we have released a commemorative 2009 Abraham Lincoln calendar. Most of the photos in the calendar also appeared in the book. The large calendar opens to 13" x 22" (vertical). 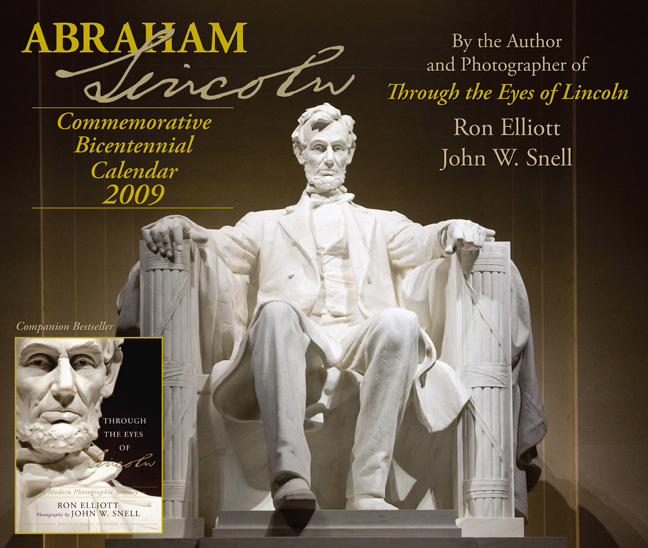 Author Ron Elliott supplied numerous Lincoln-related historic facts that appear in various date squares of the calendar grid. As a bonus, inside the back cover of the calendar is a web link that contains 20 questions whose answers can be found by studying the historic facts sprinkled throughout the calendar. A very good learning tool, indeed! Quantities are limited, so get yours now! In addition to ordering them from me, these calendars are also available at Lexington, Kentucky retailers such as Joseph-Beth Booksellers(859-273-2911) and Barnes & Noble (859-543-8518). Also carrying the calendars: The Kentucky Artisan Center at Berea, Ky (859-985-5448). Bookstores in the Louisville, Kentucky and Cincinnati, Ohio area, as well as south central Kentucky, southern Indiana and central Illinois also stock the calendar. Call ahead for availability. All images and text Copyright John W. Snell, 1999-2008. This page last updated on August 30, 2008.